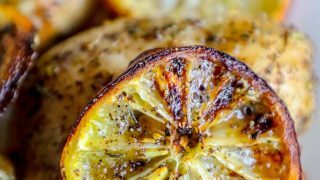 Easy Air Fryer Lemon Chicken Recipe – a simple five ingredient recipe for crisp and juicy air fried lemon chicken with under five minutes active cooking time! 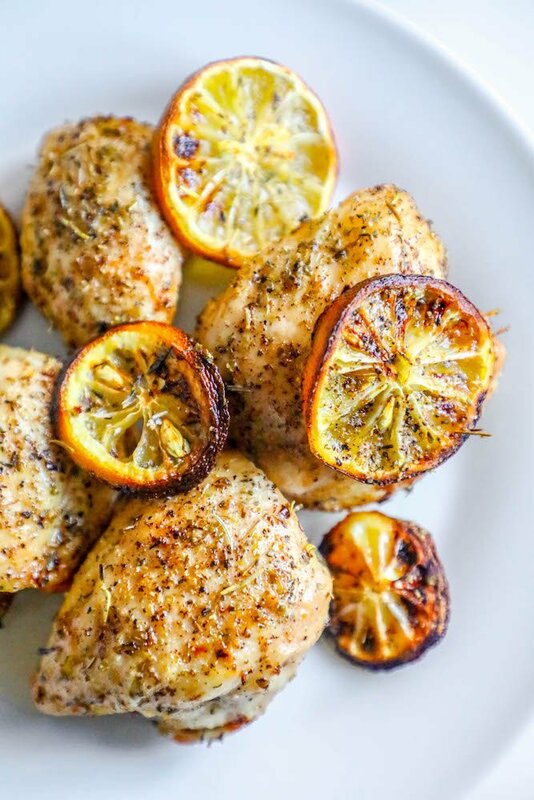 This easy lemon chicken recipe is super simple and crazy quick – it requires less than 5 minutes active time. 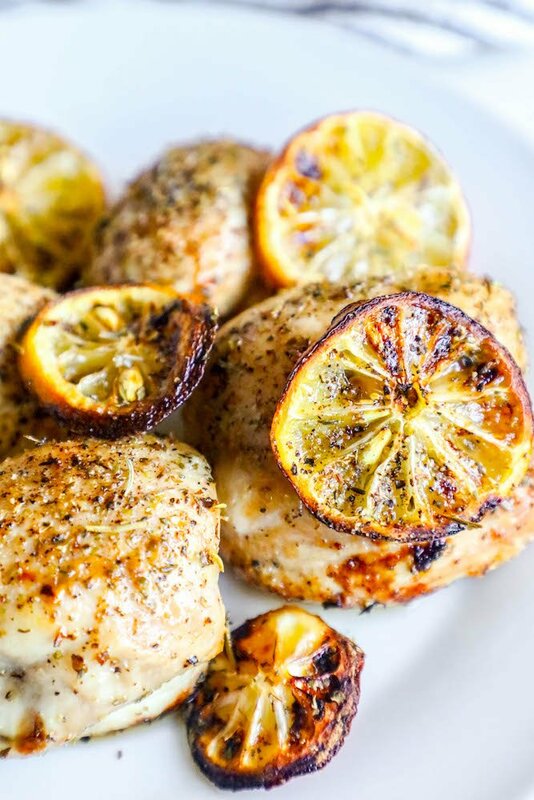 Just toss chicken in a lemon marinade, cover with spices, and toss into an air fryer, and cook! If you’re making dinner for a guest, or want a delicious hearty dinner you don’t have to fuss over, this recipe for perfect juicy chicken thighs is for you! Air fried chicken thighs are incredibly delicious – juicy on the inside, and crunchy on the outside – just like fried chicken. But because we’re using an air fryer, this recipe uses a tiny fraction of the oil, no breading, as well as hot air circulating quickly over the chicken, to fry this chicken in a much healthier way. 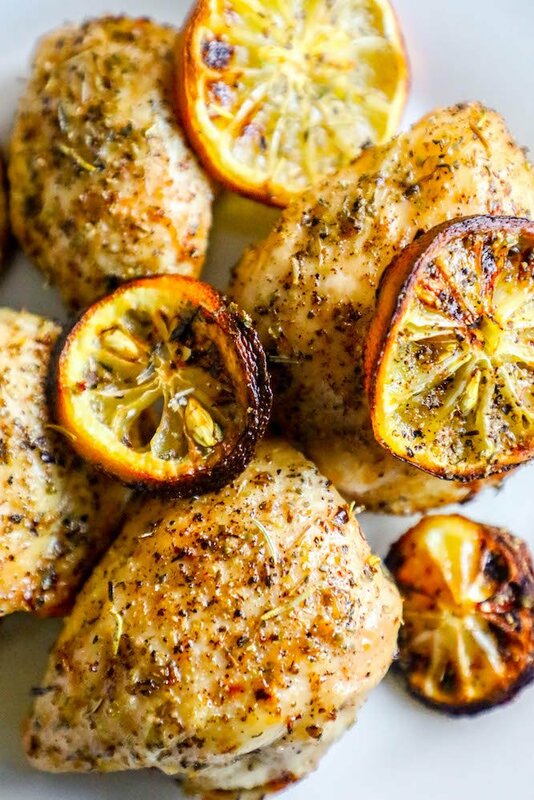 If you love my easy and delicious best easy baked lemon chicken recipe, you’re going to love this easy air fried lemon chicken recipe. Just Take Me To The Easy Air Fried Lemon Chicken Recipe Already! I get a lot of comments and questions on my posts, and get lots of requests for additional information from readers. I know this adds a lot to scroll past, but there is a lot of helpful tips and tricks to making perfect air fried chicken thighs packed in this post. If you’d rather skip over that, please scroll to the bottom of the page where you will find the recipe. Cooking chicken thighs in an air fryer couldn’t be any easier – simply toss the chicken in the fryer basket, make sure the thighs aren’t touching very closely, and fry. To make these chicken thighs perfect, we’re using the basic cook-time from my Air Fried Adobo Chicken Thighs. I cook chicken thighs at 350 degrees in my Phillips air fryer. Place chicken in the basket of an air fryer, making sure they don’t touch. -Cook chicken for 10 minutes on one side. -Flip to the other side and cook for another 10 minutes. This recipe is one of my favorites because it can be used with either chicken breasts or chicken thighs. Place chicken in air fryer basket, standing against sides of basket if necessary – do not push closely together. Set to 350°F and cook for 15 minutes. Turn chicken; cook 5 to 8 minutes longer or until chicken reads at least 165°F when a digital thermometer is inserted into the thickest part of the chicken. To get the most flavor possible, I like to make a quick marinade for this chicken, especially when using chicken breasts. Let chicken sit for at least 1 hour in marinade, then pop in fryer basket and cook! This air fryer chicken is keto and low carb compatible – and great alongside pasta, rice, and other carbs, too! This lemon air fried chicken isn’t just incredibly delicious – it also works in a keto diet, too! 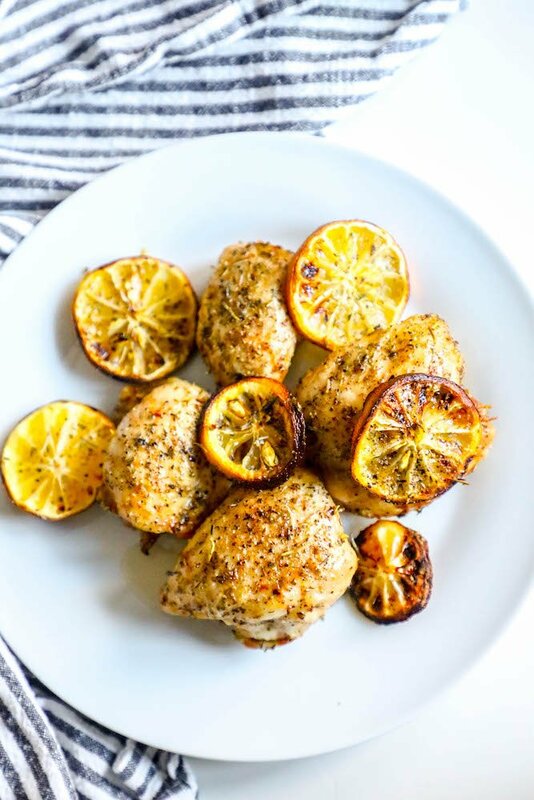 Keto air fried lemon chicken is a meal that won’t weight you down, and will keep you fueled up all day – just like many of my favorite keto chicken recipes. 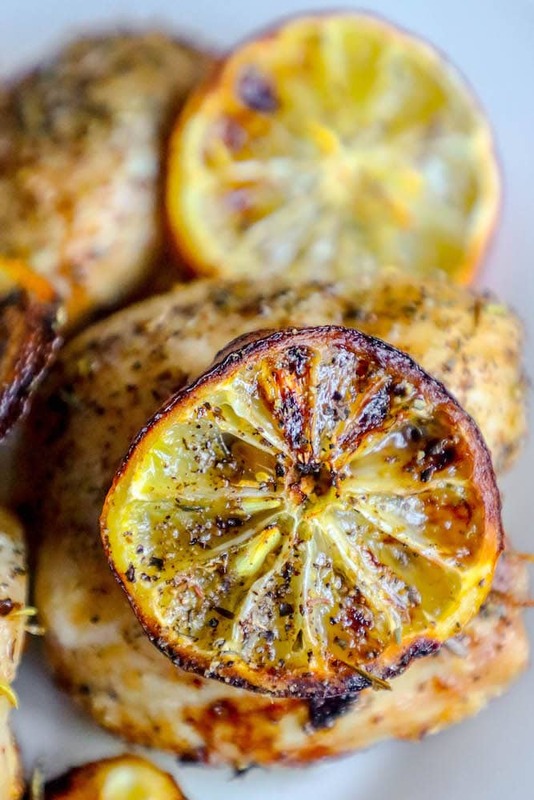 If you love this easy air fryer lemon chicken recipe as much as I do, please give it a five star review and help me share on facebook and pinterest! 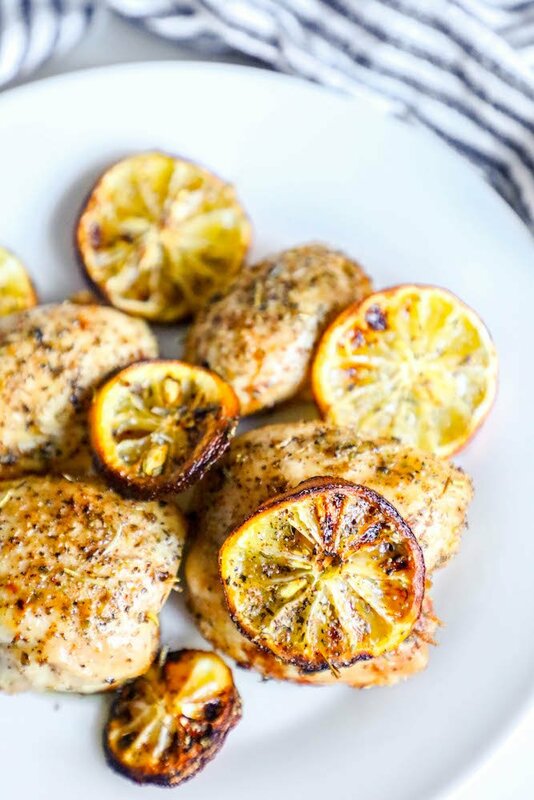 Easy Air Fryer Lemon Chicken Recipe - a simple easy recipe for crisp and juicy air fried lemon chicken with under five minutes active cooking time! Add all ingredients - except sliced lemon - to bowl or bag, toss to coat chicken. Let marinate for 30 minutes to overnight. Arrange chicken thighs and lemon slices in air fryer basket, taking care to not push chicken thighs too close to each other. Set air fryer to 350 degrees and cook for 10 minutes. Remove fryer basket and flip chicken thighs to other side. Cook again at 350 for another 10 minutes. 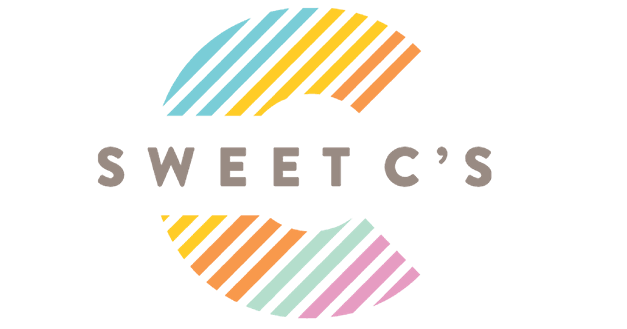 Chicken thighs will be crispy, with clear juices, and reach 165 degrees internal temperature when checked with a digital thermometer inserted in the thickest part of the thigh.